Hippocrene Saxophone Ensemble: 15 Feb. and 1 Mar. The program features pieces by CF2 members and others, including three world premieres for saxophone octet. RSVP to the Avalon Event on Facebook! 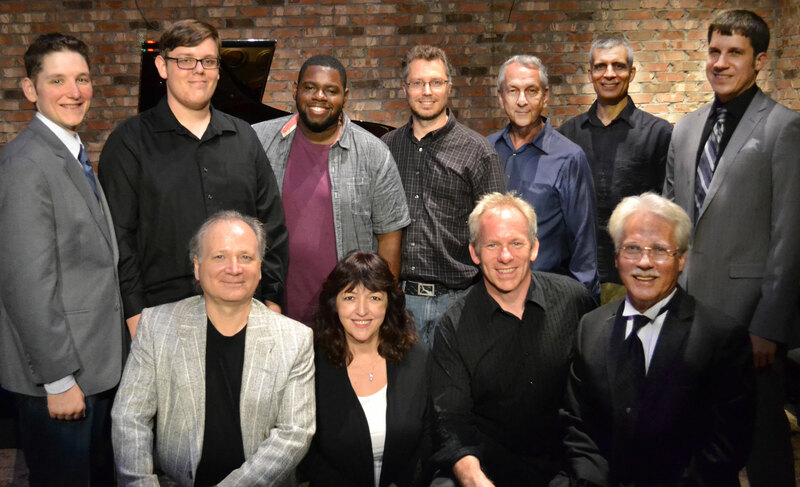 New Piano Music by Central Florida Composers at the Timucua White House, presented by Central Florida Composers ForumFree admission, but donations are accepted, and guests are encourage to bring a bottle of wine or some tasty food to share. You’re invited to a concert of Music for Saxophone and Electronics on Sunday, October 5, 7:30pm at the Orlando White House (2000 S Summerlin Ave.). Timothy Rosenberg, Brian Smithers, and George Weremchuk will perform music by Central Florida composers Thad Anderson and Timothy Stulman, as well as works by Jay Batzner, Bill Ryan, and Morton Subotnick. Admission is free, though guests are encouraged to bring a bottle of wine to share. Donations are welcome to support the group. Weremchuk and Anderson are professors at the University of Central Florida Music Department. Rosenberg, Stulman, and Smithers teach at Full Sail University. The concert will feature music that combines the expressive range of the saxophone with the infinite sonic possibilities of computer technology. Join us in getting a little funky this summer. This month at the Orlando White House, local funk band ISM will present a concert of new works by Central Florida composers. Tickets are $15 and can be reserved by backing our Indiegogo project. If you can’t make it, you can still get an audio or video recording of the concert by supporting it. CF2 is hosting H2, one of the leading saxophone quartets in the world. They will be performing on Sunday, May 5 (7:30pm) at the Orlando white house (2000 South Summerlin Ave., Orlando). Tickets are available at https://www.artful.ly/store/events/1017 for $7 or $12. Listen to them at http://h2quartet.bandcamp.com/. The Collide Festival is a multifaceted event that brings together composers and percussionists. The day begins with a composition symposium with students presenting works from Stetson University, Rollins College, USF, and UCF, moderated by composition faculty from these institutions. The afternoon features a concert of high school percussion ensemble performances from around Central Florida and the evening program spotlights the music of guest composer Marc Mellits. 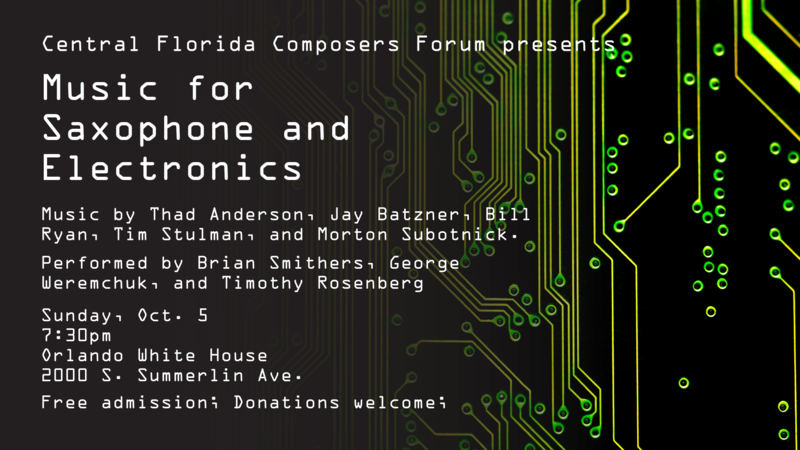 Central Florida Composers Forum invites you to a concert that’s sure to be electrifying! Join us for “Ghost in the Machine” on November 10 at 5:30pm at the White House (2000 South Summerlin Avenue, Orlando). All compositions on the concert contain an electronic element, ranging from interactive computer patches, to surround sound, to recorded ambient noises. The concert will feature several premieres, including Charles Griffin’s Enfold Us Beneath Open Wings, John Alvarez’s Fermions and Gauge Bosons, and a new work by Thomas Owen. Other featured composers are Thad Anderson, Keith Lay, and Timothy Stulman. The concert will also feature the talents of vocalist Michelle Amato and Julie Bateman, saxophonist Timothy Rosenberg, and percussionist Nick Stange. The concert is part of the Accidental Music Festival, and is free and open to the public; however, you can purchase a ticket to reserve a seat for $10, or a festival pass for $70. As is the White House tradition, audience members are encouraged to bring a beverage or snack to enjoy before or after the concert.